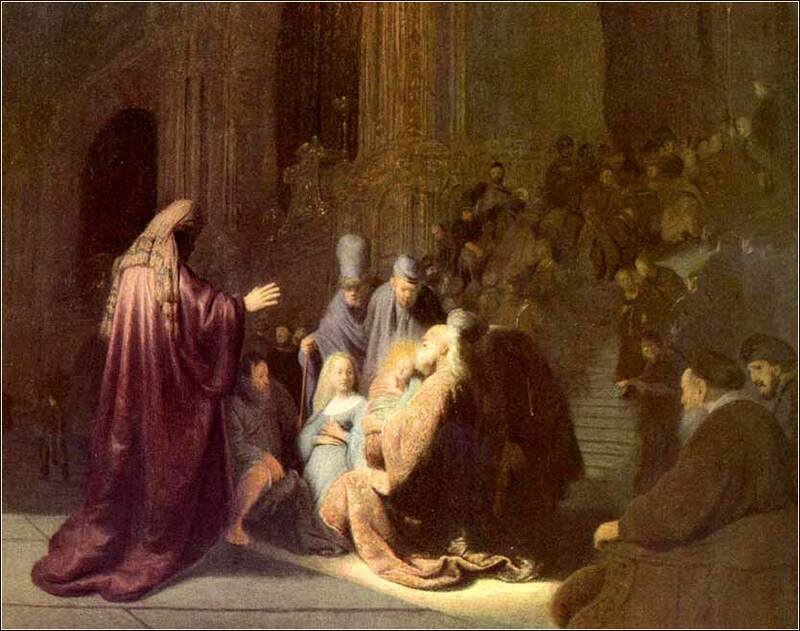 Simeon at the Temple (detail), Rembrandt ca. 1631. 490 people in our community are currently praying with you. Eternal God, this joyful day is radiant with the brilliance of your one true light. May that light illuminate my heart and shine in my words and deeds. May the hope, the peace, the joy, and the love represented by the birth in Bethlehem fill my life and become part of all that I say and do. May I share the divine life of your son Jesus Christ, even as he humbled himself to share my humanity. Bless me and the feast that You have provided for me, let me be thankful for the true gift of Christmas, your Son. Lord God, sometimes I feel like a lost child, alone in the woods or on a strange street. I cannot see the road ahead of me. I fear what lies in the shadows. I have no idea where I am going. I cannot know for certain where it will end. Nor do I really know myself. And even though I am trying to follow your will, sometimes I can't be sure whether I am or not. Sometimes, I think, I am fooling myself. But I believe that the desire to please you does in fact please you and that you will direct me, even if sometimes I get it wrong. I hope and pray that I will at least not do anything today that I am certain will displease you, and I know that if I do this, you will lead me by the right road, though I may know nothing about it. Therefore I will trust you always. Though I may seem to be lost and in the shadow of death, I will not fear, for you are ever with me and you will never leave me to face my troubles alone. There was a man in Jerusalem, whose name was Simeon; and the same man was just and devout, waiting for the consolation of Israel: and the Holy Ghost was upon him. And it was revealed unto him by the Holy Ghost, that he should not see death, before he had seen the Lord's Christ. When they arrive, they find waiting for them a sort of private prophet, a man of great holiness named Simeon, touched by the Spirit, who waits in the courts of the great Temple to see the Messiah; for the Spirit has promised Simeon that he should see the Christ child before his death, and this is all Simeon waits upon before he dies. The lovely canticle he recites is sometimes called the “Canticle of Simeon” but is also known by its first two words, in Latin: Nunc dimittis, “Now you dismiss (your servant)”. The revelation that this baby was the Messiah, so strongly prophesied in the holy literature of Judaism for 800 years, was made only to a very small number of people. Christ's birth was practically forgotten by the time He began to preach, when He was about 30 years old. Here, we have the oddity of a holy man declaring that he is now ready to die, because he has seen the Christ, right in the epicenter of Judaic religious practice, the Temple itself — and yet very few people seem to take notice. But the beauty of Simeon's song would echo in history, for here was a man so powerful in faith, that his only wish was to see Christ and then give up earthly life. The strength of his conviction inspires us today. Simeon also echoes the odd prophesy of Isaiah. The Jewish Messiah did not come to save the Jews only; He had come as a “light to bring revelation to the Gentiles” as well, a sentiment unheard of in the Temple, where Gentiles were an abomination. The beginning of Nunc Dimittis from a 1412 Book of Hours (Les Très Riches Heures du duc de Berry), a sort of prayer book.